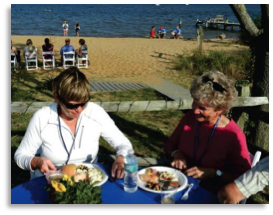 From Seafood feasts, awards banquet, anniversary party, to parties on board or on shore, we love to socialize! Such gatherings are one of our best ways we get to know each other. With members from Maryland, Virginia, Washington D.C., Delaware, Pennsylvania, New Jersey and points beyond, it's fun to discover neighbors as well. We do a Thanksgiving dinner, and Fireside Chats, celebrations of many kinds. Just give us an excuse and we'll throw a bash!